Amazon offers the Earthwise 11-inch 8.5A Corded Electric Tiller for $89.78 shipped. Also at Walmart. This tiller has a list price of $130 but it usually sells for around $110. It’s bounced back and forth between this all-time low price and the regular going rate a few times during the holiday season. 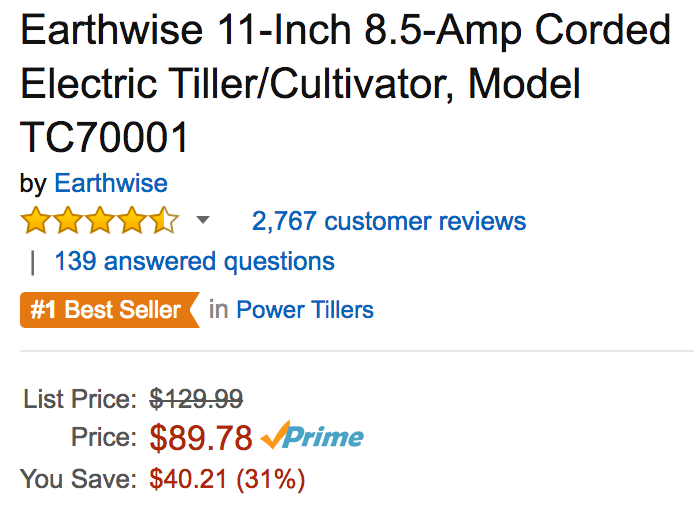 This is the best-selling power tiller at Amazon, collecting a 4.6/5 star rating from over 2,700 reviewers. Features include four steel tines that cut up to 11-inches into the ground. Built-in cord management is helpful for keeping your workspace clear. You’ll want to pick up an extension cord to provide electricity to your new tiller. Give this 100-foot long option that is designed for outdoor jobs a try at $27 Prime shipped. The Earthwise Tiller Cultivator is a zero emission solution for your garden. With its durable tines and compact profile, the Earthwise Tiller Cultivator is perfect for new gardens, tilling in narrow rows and raised beds, or along fences. It features an 11″ cutting width and a tilling depth of 8″ for easy cultivating and planting. Its four steel tines can cultivate packed, hard dirt with ease. Includes an ergonomic handle with cushioned grip and a convenient cord retention hook as well. Flip down wheels for easy transportion. No gas, no fumes. Earthwise is the Clean Air Choice!